Well worth a look for the excellent editor, but Gator's blog is weak, and the web store can't match the best of the competition. Texas-based HostGator is a hugely popular website builder with plans for every possible requirement, from simple shared products to speedy cloud hosting and powerful dedicated servers. Gator Website Builder bundles the company's excellent hosting with a user-friendly WebsiteBuillder.com-powered site designer which makes it easy to create a quality online presence. The service is absolutely stuffed with features, and almost all of them are available in even the cheapest plan. There's unlimited pages, storage and bandwidth, a free domain name, a bundled SSL certificate, 200+ mobile-friendly templates, support for password-protected pages, analytics to help understand your audience, and 24/7/365 chat, email and phone support to keep your site running smoothly. At the time of writing, Gator offers three different plans. Starter gives you all of the above for an initial $4.99 a month billed monthly, $4.61 on the annual plan, or $3.84 if you pay for two years up-front. These prices include a 50% discount for the first term, and on renewal they'll jump to $10.95 billed monthly, $8.95 over one year, $7.95 over two. The Premium plan adds 'priority support', which the website says allows 'even faster access to support by jumping the line.' There's no way to reliably say how much difference this will make, but if you're building some mission-critical business site, say, it could be worthwhile. The discounted first term is priced at $6.49 billed monthly, $6.14 over a year, $5.99 on the two-year plan, and on renewal these rise to $11.95, $11.95 and $10.95. The top-of-the-range eCommerce plan includes Gator's web site, with inventory management, integrated shipping and tax calculations. It's notably more expensive, but still reasonably priced for what you're getting at an initial $12.49 billed monthly, an equivalent $9.99 on the annual plan, $9.22 over two years, rising on renewal to $24.98, $19.98 and $18.45. There's no trial period, but if you cancel within 45 days, and you've never had a HostGator account before, there's a refund available. Readers can take advantage of a slightly higher 55% discount, by using the code ‘techradar’ (without quotation marks) at checkout. Signing up for Gator Website Builder is simple and straightforward. Moments after handing over the cash, a HostGator email arrived asking us to verify our email address. We clicked a link, the website displayed a 'verified' message and redirected us to Gator's web dashboard. The thumbnails don't give you much of an idea of the individual sites - in some cases, there's little more than a menu and a large image - and they don't have captions showing you the intended site type. If you've not chosen the Photography filter, for instance, you won't necessarily be able to tell which sites are designed for photographers. Fortunately, a Preview button opens the template site, allowing you to see how it works. This opens in the current browser tab, rather than a new tab or window, potentially a hassle if you want to compare two templates side-by-side. 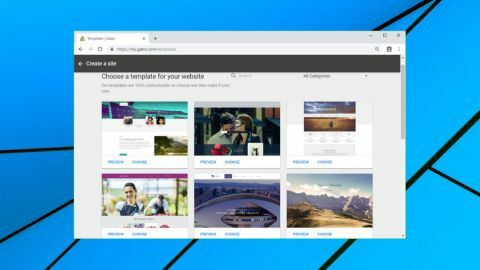 But it's easy to use, has buttons to preview the template in desktop or mobile layouts, and you're able to select and begin editing the template with a single click. The Gator Website Builder editor opens with a simple 15 second tour which highlights its various core functions. Sure, it's short, but it gives beginners a quick idea of how to get started. The editing interface is familiar and straightforward. A left-hand sidebar enables adding various types of content to the site; a toolbar at the top of the screen has a range of essential functions (page navigation, undo/ redo, desktop or mobile views, Save, Preview and Publish options), and the rest of the screen is reserved for the content of your current page. Each section comes in multiple flavors. The Text section has 15 predefined blocks, for instance, each with its own layout and formatting. Sections like Images & Text, Video & Text and Text & Buttons allow you to include further content. Pick whatever most closely matches your needs, and you can add it to the page in a couple of clicks. Each section is built from elements, individual page objects such as menus, images, text boxes, forms, videos, social media content, and more. Page layouts are generally very flexible. Existing section elements can be moved or resized, and new elements may be dropped onto the page to pixel-level precision. Clicking any object within a section - a text block, an image, a menu, social media buttons - displays a floating toolbar with actions you can perform on it. These start with a decent set of standard options, including the ability to add animations (have an image fly in from the left, for instance), use drop shadows, or have the element move with the page. But there are also a huge number of more element-specific tweaks to explore. Gator generates a mobile view of the site as you work, and although this typically works well, it won't always deliver the results you want. You might drag a map to overlay an image in the desktop view, for instance, but on a mobile the map will probably appear underneath. If this doesn't work for your site, you can edit the mobile site separately, for example dragging and dropping the map to reposition it, or perhaps setting an element to be hidden in the mobile view. For all this power, smart design keeps Gator easy to use. Key functions are available in a click or two, and most of the complicated stuff is tucked away where it won't baffle newbies. Overall, it's a well-balanced editor which has plenty to offer both first-timers and more demanding users. Adding a blog to your Gator site, and managing it afterwards, is quick and easy. The process starts by selecting your preferred templates. We were given fifteen options for our test site, and they all looked good, although they were perhaps a little graphics heavy. New blog posts are created using a subset of the standard page editor. There are all the usual text formatting commands, but you don't get access to the main editing widgets, and the Add Element box only allows for the insertion of images, videos, lines, headings and paragraphs. If you want to add a map, or an image gallery, or any of the other components available in the main editor, you're out of luck. There are plenty of ways to customize how your post looks and behaves on the blog page. You're able to set a title, a cover image and a summary, as well as assigning tags to help users find related posts, and pin a post to the top of the blog. There's no option to schedule posts, unfortunately. Blog comments are supported by the Facebook comments system only, which can't be controlled or configured in any way. The blog has one advanced feature in its optional RSS support, but otherwise it's very much about the basics only. Gator Website Builder's high-end eCommerce plan gives you an option to extend your site with a simple web store. The store supports both physical goods and digital products. A digital product can be up to 1GB in size, and you can make the download time-limited, or set a maximum number of times a customer can download the same product from a single purchase. If you need to import a ready-made product catalog, Gator accepts various formats such as Excel, Google Sheets, ecwid, and CSV. If your needs are more modest and you only have a few products to sell, you can input the data manually as well. Product descriptions are basic, but there is enough power here for many simple sites. You start by entering one or more images, along with some formatted text and a price. There's support for product variants (size, color) and organizing products into categories (shoes, accessories). Setting up and applying discounts should appeal to potential customers, and adding a weight allows the site to automatically calculate shipping rates. None of this begins to compete in depth and power with specialist e-commerce providers like Shopify, but Gator is undeniably easy to use, and much cheaper. You could manually add three or four products in a few minutes. Shipping and tax calculations (with international support) are built in, PayPal integration enables taking payments right away, and creating a Stripe account gets you card support, too. There’s also an option for Cash on Delivery. Experienced users won't be impressed, but Gator Website Designer could be a reasonable choice for creating a simple web store. Gator Website Builder's smartly-designed editor is a great way to quick create professional and good-looking websites. The integrated blog and web store are relatively basic, though, and are unlikely to satisfy demanding or experienced users.